Evolution has already solved many of the challenges engineers are confronted with on a daily basis. Think about octopuses, for example. We frequently report on soft robotics here at Gizmodo. 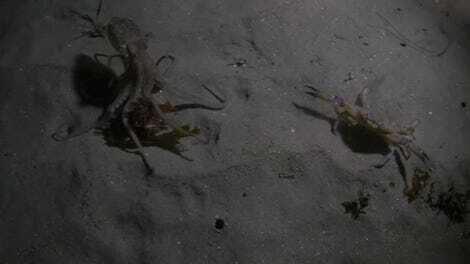 Octopuses are essentially brilliant, eight-armed soft robots. So when it comes to solving other underwater challenges, like adhesives staying sticky underwater, a team of researchers knew exactly which cephalopod to ask for help. 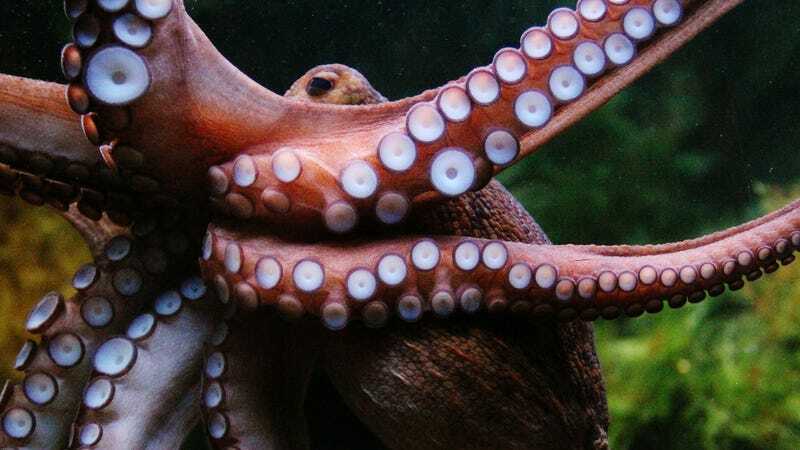 Their new octopus-inspired adhesive could potentially find uses in medicine and other fields of research where things typically get wet or moist. But it’s mainly interesting for how it’s helped them understand the squid’s sticky grip. If you’ve ever seen an octopus tentacle, you’d know it’s covered in little suckers, each a deep suction cup with a ball in the middle. Pang and his team wanted to figure out how the tentacles stuck to things underwater, so they made their own tentacles. Rather than a long appendage with protrusions, they instead produced a polymer sheet with dimples tens of micrometers across, each with a little sphere in the middle. They experimented with various sucker radii, finding that the stickiest adhesive had 50 micrometer dimples arranged fairly densely. They tried several different dimple shapes, and the octopus-inspired one was the stickiest by far under moist conditions, underwater, and under oil. The researchers put their sticker under a microscope to see how it got so sticky. Essentially, each dimple fills with water. When you press down on the back, the whole thing compresses, trapping water beneath the sphere. This leaves a vacuum chamber when you release the pressure. Underwater stickiness is a challenge, Emre Kizilkan, researcher from the the Zoological Institute at Kiel University in Germany, told Gizmodo, so he was especially impressed by this octopus-inspired tape. “This absorption of the liquid underwater is quite unique,” he said. But he pointed out that it’s not as sticky as dry sticky tape. Scientist Francesca Tramacere from the Istituto Italiano di Tecnologia agreed that there were some things left to do, like improving the way that the tape un-sticks. That would be especially important if you needed to stick something, like a bandaid, to wet skin, for example. An underwater adhesive like this would have lots of promise as medical tape applied over a wound, according to the paper published today in the journal Nature. It could just be useful for moving things around, or to put on boats to prevent algae from growing on their hulls. And right now, the team thinks they could commercialize their tape in three years. Octopuses are seriously awesome, and there’s tons of other secrets we might be able to unlock by studying them. Tramacere thought it was especially interesting for its ability to vary its own stiffness, for example. Folks have even tried making octopus tentacle-inspired prosthetic arms. So clearly, cephalopods are doing something right.